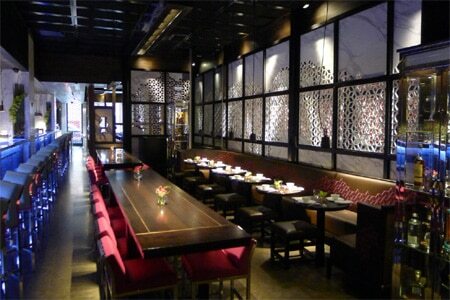 Savor progressive Chinese cuisine in a sumptuous space at this NYC branch of the London original. : London's modern Chinese restaurant Hakkasan has expanded with locations all over the world, including sister establishments in Miami and Manhattan. A long blue-lit bar runs along the large, sumptuous space, which is segmented by Carrera marble panels with geometric cut-outs. The showpiece impact of Hakkasan makes it a good option for entertaining business clients. The progressive Chinese cuisine incorporates traditional and classic influences. At lunch there's a $29 three-course menu, including starters of steamed or fried dim sum, mains like stir-fry black pepper rib-eye beef, and colorful macarons for dessert. In fact, the selection of dim sum, from prawn and Chinese chive dumplings to roast dumpling puffs, is rather impressive. The crispy duck salad plays the poultry off pomelo, pine nuts and shallots, while the chili soft shell crab is showered with fried egg yolk threads and curry leaves. On the expanded à la carte menu at dinner, several dishes --- including stir-fried lobster tail, grilled lamb chops and the pricey Peking duck with caviar --- can be accompanied by a sauce made with XO ("extra old") Cognac. Wok-fried Boston scallops are served with bamboo shoots and dried shiitake mushrooms. 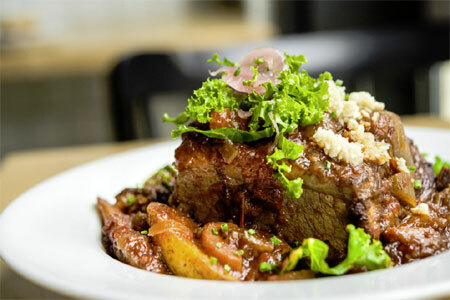 Braised pork belly with dried tangerine peel is tender and fragrant. There are also a few prix-fixe menus for parties of 10 or more. To complement your meal, choose from a number of Chinese and Japanese beers, wines by the glass, saké, and classic and signature cocktails. For dessert, a caramelized cashew and Alunga parfait is doused in silky chocolate sauce.